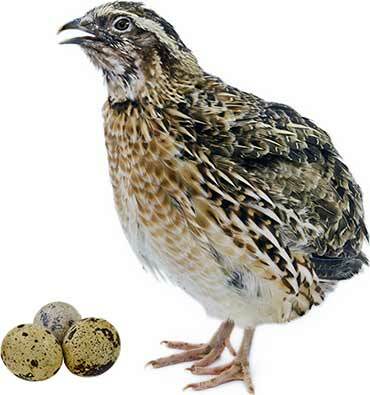 The price of quail eggs (when you can find them) reflects their luxury status, but quail are relatively easy to keep and are productive layers. They are also entertaining to watch and with a little effort can become fairly tame. If you long to start keeping poultry but have too little space, keeping quail could be the answer. A large rabbit hutch can easily be adapted for them – they could even be kept on a balcony or roof garden. They’ll need some daily attention, but as long as their hutch is secure from rats, the shutting in/letting out routine involved with larger poultry can be avoided. On a larger scale, quail can make an interesting addition to a garden or smallholding. If you’d prefer to give them a more natural lifestyle they can live in a run, but being so small they are very vulnerable to many predators, including rats and hawks. Bear in mind also that they don’t automatically seek the security of a house at dusk like chickens do. Quail are part of the pheasant family and prefer to live close to the ground, so they won’t use houses with high ramps. Neither do they require perches or nest-boxes. However, quail are good fliers and migrate vast distances in the wild. Like their bigger cousins, they can also rocket upwards when startled, so this must be taken into account when planning housing and runs. Ventilation in their house is particularly important as quail produce higher levels of ammonia than other poultry. They’ll need some extra protection when the temperatures fall, but can continue laying throughout winter if artificial lighting is provided. Depending on the light levels, you can expect quail to come into lay from around 8-12 weeks old. They should then lay well for their first year or so, with natural life-expectancy being two to four years. Eggs are small but have a high proportion of yolk to white, and apart from being a delicious little titbit can also be used in many recipes requiring eggs. Like chickens, females will lay without a male being present, so there is no need to keep one unless you want to breed quail. Males are much quieter than cockerels but will fight if kept together, so any surplus are best fattened for the table. They are very tasty to eat but you will need at least one bird per person – two is often recommended for a main course. Quail have been kept for eggs and meat for thousands of years. Now almost any aspiring poultry-keeper can enjoy these bygone delicacies. Start keeping quail today, and you could be offering their eggs around at your next party. This section contains general articles about keeping Quail. From our beginners guide to advice on housing and feeding, this is the place to learn about keeping Quail at home or on your smallholding.